It's a simple question: Should you add collection fees to delinquent patient accounts? Unfortunately, there is no simple answer. Placing accounts with a third-party collection agency is an important part of the revenue cycle management (RCM) process, as is adding collection fees at the time of placement. 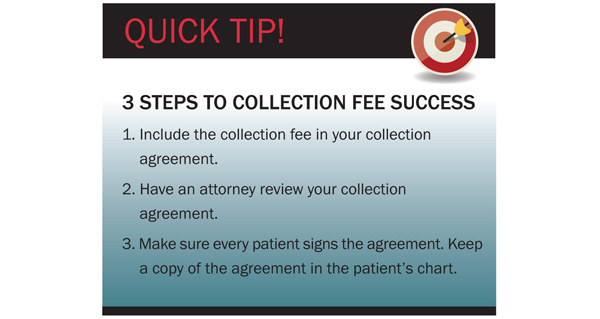 A collection fee is assessed when a physician or practice needs to submit an unpaid patient account to their collection partner. Given that many issues have recently risen around the practice of adding collection fees, many billing companies remain unsure about if and how their clients should implement it. Primarily at issue is the law. From a federal perspective, we can turn to the Fair Debt Collection Practices Act (FDCPA), which allows for the practice of adding collection fees. In section 808(1) 15 U.S.C. 1692f (1), it states that the collection of interest, service fees, collection cost, or other expenses to the original debt is permitted when "such amount is expressly authorized by the agreement creating the debt or permitted by law and can be an amount incidental to the original amount... expressly authorized by the agreement creating the debt." If state law expressly permits service charges, a service charge may be imposed even if the contract is silent on the matter. If state law expressly prohibits service charges, a service charge cannot be imposed even if the contract allows it. If state law neither affirmatively permits nor expressly prohibits service charges, a service charge can be imposed only if the customer expressly agrees to it in the contract. After reviewing the relevant state law in light of section 1692f(1) of the FDCPA, it is then time to consider the contract that creates the debt. The document must specify what the fee is going to be and must be signed by the patient before a creditor can legally assess such a fee. In this case – as with much in life – it's all in how you say it. On this point, Kaminski references the case of Bradley v. Franklin Collection Services Inc. (739 F.3d 606 (11th Cir. 2014)). In that decision, the court held that there was no entitlement to a percentage-based fee because it was not expressly stated in the contract with the consumer. The court noted that "when Bradley signed [North Alabama Urology PC's] patient registration form, he only agreed to pay 'all costs of collection.'" That is, Bradley agreed to pay the actual costs of collection. His contractual agreement with Urology did not require him to pay a percentage-based fee where that fee did not correlate to the costs of collection. The court in Bradley did not state that a percentage-based fee could never be charged but emphasized that such an agreement must be expressly stated in the contract. So what do other agencies have to say on this topic? The Consumer Financial Protection Bureau has so far been silent. The agency has, however, issued its Advance Notice of Proposed Rulemaking about the debt collection system, consumer experiences with the debt collection system, and how rules for debt collectors might protect consumers without imposing unnecessary burdens on the industry. The agency's recommendations may be released sometime in 2015 and may or may not address the issue of collection fees – only time will tell. Bottom line: having collection fees in your clients' patient agreements and providing proof of their signature on the agreement is vital. Healthcare debts can be a tremendous strain on households and are unfortunately at the bottom of the pile of bills facing patients today. Once a bill is in collections, the collection fee can become a negotiating tool. Your client's willingness to negotiate on a portion, if not all, of this fee can be the difference between getting paid something versus nothing. Pam Long is vice president of sales for ACCESS Receivables Management. She has more than 15 years of experience and expertise in providing A/R related solutions to the healthcare industry. Long serves the needs of hundreds of ACCESS clients throughout the US and is frequently called on to assist clients in developing new and innovative ways to address revenue cycle management. 1 Id. at 13 (citing 15 U.S.C. § 1692f(1) and staff commentary on the Fair Debt Collection Practices Act, 53 Fed. Reg. 50, 097, 50, 108 (Fed. Trade Commission 1988)). 2 Seeger v. AFNI, Inc., 548 F.3d 1107, 1110, 1113 (7th Cir. 2008); see also Boatley v. Diem Corp., No. CIV. 03-0762-PHX-SMM, 2004 WL 5315892, at *5-6 (D. Ariz. Mar. 24, 2004).